Before we learn how to succeed in WooCommerce dropshipping business, let’s start with the basics. What is WooCommerce? And why can it be interesting for you? WooCommerce is a special platform for online stores. It integrates with WordPress and works with it perfectly. Store owners benefit from high functionality and convenience of WooCommerce. No wonder that this platform is so popular among dropshippers. When you build your online store on WooCommerce, you get a webstore that is easy to manage. You have full control over your store, and you easily run all the operations. As you know, dropshipping business becomes more and more popular every year. Men and women across the globe start their own dropshipping stores because this business gives them independence and financial security. When you run a dropshipping store, you don’t need to buy any products in advance, so you can start your business with really low costs. You simply find dropship suppliers you like, and list their items on your site. You only contact the supplier and purchase the necessary item when an order is placed by a customer, and you ask them to deliver the item by your client’s address. In other words, you spend no money on creating and managing stock, and don’t arrange shipments yourself. It means you are left with much greater profits! All you need to do to start such an easy and rewarding venture is set up your own online store – and this is where your business road begins. Why is a good idea to dropship with WooCommerce? You can build your dropshipping store on various platforms. One of the most popular of them is WooCommerce. According to a recent research by Builtwith, more than 39% of all the online stores worldwide are powered by WooCommerce. On a global scale, it makes WooCommerce a number one solution for building online stores. The reason why this platform is so popular is its convenience and flexibility: using various additional plugins and themes, you can customize your online store the way you like and add any extra features you need. There exists a countless number of useful plugins that cover various aspects of your dropshipping store (pricing and checkout, integration with payment systems, design, etc.). It means that you are free to choose any additional features for your business and to make your store a truly unique destination: you can generate and print invoices and packing slips, integrate your orders and customers to various CRM systems, and do many other things that improve your service. There are different solutions for automated order processing that can save tons of time and help you sell and ship products all over the world. When plugin is installed and activated, you are provided with full setup instructions. You choose and set the main basic parameters for your store. As soon as this process is completed, you can start adding products to your store, uploading images and descriptions to product page, setting prices, and also installing any additional plugins you consider necessary. What are the pros and cons of WooCommerce dropshipping? No doubt that WooCommerce makes dropshipping process easier. It is compatible with many plugins that cater to various ecommerce needs. Still there are some specific aspects to be considered. You don’t need significant initial investments. You don’t have to deal with stock and delivery matters. You can develop your own brand. You can easily upscale your business: cooperate with unlimited number of suppliers, add as many products and product categories as you want. Your design options are almost unlimited. Advanced SEO options are at your disposal. Not all suppliers allow dropshipping. You cannot control the delivery process and can only hope that your supplier is responsible enough. You don’t know for sure if the quality of goods is good enough and in what condition they will be delivered to your customers. You risk to face absence of products at the supplier’s stock. WooCommerce doesn’t provide 24/7 customer support as they do not have a central customer support staff. However, if you find trusted merchants who supply and deliver high-quality goods, you can launch a successful business without much efforts and make your ecommerce dreams come true. Is WooCommerce dropshipping suitable for me? If you are a total ecommerce beginner. If you want to run your own business without inventory, storage and delivery fuss. If you want to earn a startup capital for the opening of a full-fledged online store in the future. If you need full control of your ecommerce store. If you want to enhance your store with thousands of site designs and plugins. If you are ready to handle some technical work to launch and run your website. If you’re one of those people who like to do everything on their own. If your budget is limited, and you don’t want to spend extra money. If you already have a WordPress site and want to use it as a basis for your store. If you do without 24/7 customer support. WooCommerce dropshipping provides you with excellent opportunities. But finding reliable suppliers must be your priority. Why is it best to fill your dropshipping store with AliExpress products? To add products to your dropshipping store, you first of all need to choose a reliable and trustworthy supplier. It is quite common to visit AliExpress in search for the most suitable supplier. We have already discussed the reasons why AliExpress is a wonderful destination for WooCommerce dropshippers. There is no wonder, then, that dropshippers worldwide generally consider AliExpress to be the best platform to work with. This is why it’s a great idea to have specialized software that imports products from AliExpress to dropshipping stores. This, in turn, means that there is a high demand for special WooCommerce dropshipping plugin for AliExpress, and we are happy to introduce you such a solution. You can order from sellers automatically and you don’t have to enter all the data manually. As soon as you get an order from a customer, the plugin visits AliExpress and fills in all the order data automatically (product details and variations, customer’s address, etc.). To confirm your purchase, you will just need to simply click the ‘Pay Now’ button, and order notification email will be sent to the customer. 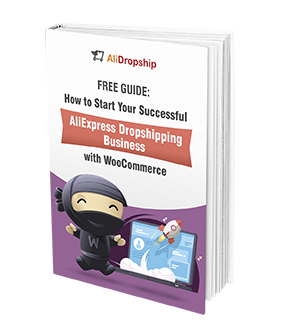 To learn more about earning great profits with this business, download our free guide and get some new insights into WooCommerce dropshipping. Can you explain to me the difference in using Alidropship by itself as opposed to using it with Woocommerce? Can we use the affiliate for AliExpress in the Alidropship woo plugin? Yes, affiliate system is also integrated in AliDropship Woo plugin. Do I have to register in Woocommerce.com platform and pay for one year SINGLE SITE $129.00? Or I can just add Woocommerce free plugin in WordPress? And then add Alidropship Woo? What if I’m not dropshipping with AliExpress? What if I’m dropshipping from several private/other retailers? Does WooCommerce determine tax (if applicable?) and allow for flat rate shipping? Yes, you can dropship from other suppliers. As for taxes, you can search for special Woo plugins to get such functionality. Order tracking data is also collected by the plugin in Woo version. It is done autonatically, once the order is placed on Ali and your supplier ships the package. Your client gets an email notification with a tracking code included. Can I use any payment gateways on woo with AlidropshipWoo? What I’m saying it that payment gateways on Alidropship plugin is very limited, would I be able to install other payment gateways plugins from woocommerce same way one can install woo themes? Yes, you can use any payment gateways available for Woocommerce. I’m going to start a drop shipping business very soon. I’m 62 and a retired computer analyst. Been running blogs and sites and marketing online since 1992. However, I’m somewhat confused about the options. There are Shopify and Woocommerce as far as I can see. A friend recently told me about AliDropship and now I am really confused. Do I understand it correctly in thinking that If I buy the Alidropship plugin, that it comes with a theme that I can install on WordPress to run my store? Ie… Can I avoid both Shopify and Woo? If not, what are YOUR personal preferences here? Which way would you go if you were starting today? The main difference that AliDropship comes with built-in themes that you cannot use with AliDropship Woo version. However AliDropship Woo can be used with Woo themes and original AliDropship not. When my Alidropship customers buy products in my store, do they pay to me or the Ali-supplier? What I would like to know as a store owner is if have have to deal with payments or not? Your customers pay you directly on your site. Then you place orders with your suppliers on AliExpress stating shipping details of your clients. Ho for the marketing tools features do i need to pay that monthly or they are included n the price are they one time payment? Great article. I would like to know that AlidropshipWoo has a payment gateway support Cambodia country or not? Could you advice which payment gateway that support to my country? Also i m from Srilanka .can i sell my products worldwide with my website without any barriers. If I get alidropship with alidropship hosting, and I ever want to leave the host, can I take my store with me? i.e. I know you can’t on shopify. All data , products, informatiion. Absolutely! If you take AliDropship and AliDropship hosting (as well as any other hosting) your site belongs only to you (you are the only owner) and you can transfer it wherever you want.